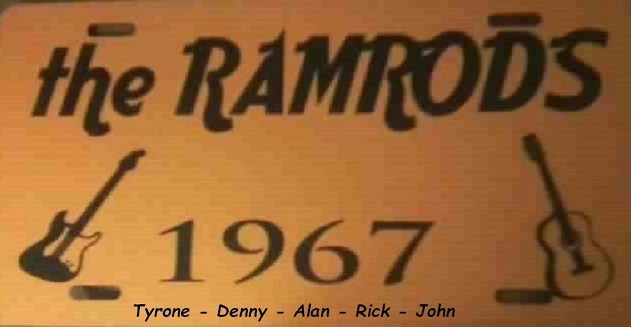 Ramrods license plate printed many years ago, though I added our names much more recently. It likely would have become the band’s bass drum insignia. Our band (Joint Effort), later (Ramrods) recorded two songs in the out of business movie theater in Sparta during July-August 1967. One of the two owners who recorded us was Dave Kalmbach. The two songs we recorded in Sparta during July/August ’67 were, “There’s a Girl I Love” on one side, and “Firewater” on the other. To us, “There’s a Girl I Love” was the A-side, “Firewater” the B-side. However, when Ray Hosier played them on WLAV 1340 AM, he said “Firewater” should be your A-side, and after giving it some thought, he was absolutely correct. Unfortunately, there are no photos of the band. There were a handful of them taken in ’67 both practicing and at gigs, but don’t know where they ended up, and believe them likely to be lost. We never missed a Saturday evening during the entire band’s history (Feb. ’67 – Oct. ’67). If we did not have a Saturday night Gig, we practiced, and no member ever missed a Saturday. We rehearsed in the lower level of a church (cannot recall the name), on the South side of Lake Dr. near Carlton Ave. in E.G.R. Quite often, people would show up to hear us practice (mostly groups of girls), who ‘somehow’ learned where we practiced? Our repertoire were songs by Beatles, DC Five, Paul Revere (Raiders), Monkees, Kinks, Byrds, Ricky Nelson, Gerry (Pacemakers), and others, plus much of our own material. High School dances, “Sock Hops” – Lowell H.S., Kelloggsville H.S., Kenowa Hills H.S., Forest Hills H.S., Grand Haven H.S., Rockford H.S. It was Rick Bursley not Beasley, And he went into the Army.